Talking to an outback 4x4 Tour leader about detecting in the summer he mentioned snakes and I said I used gaiters, he commented that he has been involved with a few situations where people have been bitten on the hand/arm, reaching down to pick up a stone or piece of wood. I use riggers gloves and thin long sleeve shirts in warmish weather which he did not think very much of as good snake protection. Even then in warm weather I am flat out detecting a few hours early morning and ditto with the mozzies late afternoon. Comments on your arm/hand protection. PeterInSa wrote: Talking to an outback 4x4 Tour leader about detecting in the summer he mentioned snakes and I said I used gaiters, he commented that he has been involved with a few situations where people have been bitten on the hand/arm, reaching down to pick up a stone or piece of wood. I use riggers gloves and thin long sleeve shirts in warmish weather which he did not think very much of as good snake protection. Bit of a long-winded reply (as usual for me). Just skim over for the info you might need. I don't use arm protection. Statistically you're going to get bitten on the hand or the ankle. Most people getting bitten on the ankle were unaware of the snake. Most people getting bitten on the hand were picking the snake up or handling it. I usually have a metal detector, camera or pick in my hands so that just leaves my ankles/legs. I was talking to folks around Bathurst, Orange and Lithgow last month and they warned me they've been getting Brown Snakes coming into their homes lately looking for mates. It's certainly time to be wary of them. Just as I wouldn't go walking on a coral reef barefoot, I'm not wading through grass or walking around rocks without putting myself at risk. Your riggers gloves would offer considerable protection against snakes although a larger snake might penetrate most fabrics. A lot of prospectors have had close calls that they've written about here on this forum. I've not been bitten by a poisonous snake before and I have no intention of ruining my kidneys or eyesight even if I survive one. I met a snake handler some years ago who did public exhibitions and he was missing fingers and thumbs from bites that he survived. The loss of fingers he attributed to Tiger Snake venom. I suspect he got lousier in handling the snakes as he lost more and more fingers. 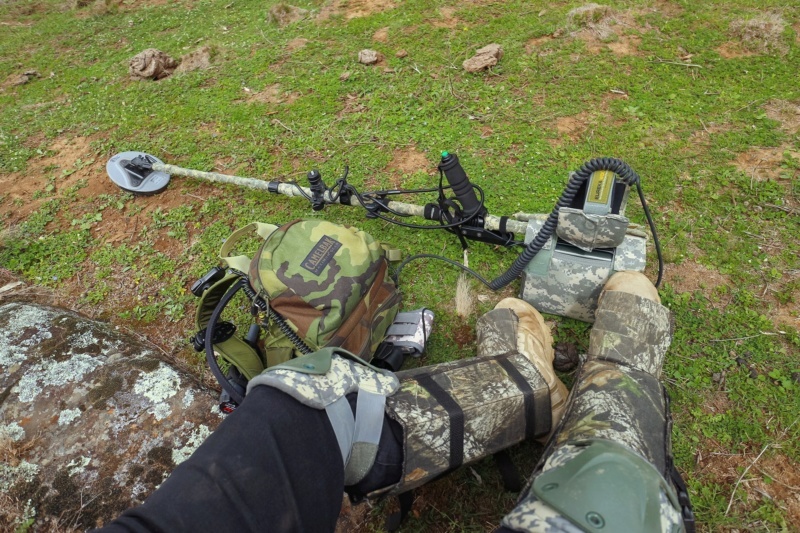 Even a survivable bite can have dreadful complications so a good set of Snake Gaiters seems to be a no-brainer. I'm not sure if the old threads migrated to our new site here but there's been a few threads on Snake Gaiters here over the years. Members often post interesting pictures of snakes they've encountered and I remember seeing how well concealed some of the Tiger Snakes were in some members photographs. I've seen a few snakes but they usually tend to take off at high speed. Last week one even rolled sideways and threw itself over a cliff and into a river to get away. However, on one occasion in 2009 (?) I was stepping over the top of a snake in low grass (was a VERY large red-bellied black snake) before my wife spotted it and called out for me to freeze. Our Australian snakes are quite varied and their method of attack and the nature of their venom differs from one species to another. As we get older it's a lot harder to fight the effects of a snake bite and if necrosis or organ damage isn't enough to deter you from leaving Snake Gaiters behind, the pain and ongoing complications from the bite of a snake is enough to have me checking by own bags before I leave home for a day or a week out. I chap I know was bitten on the back of his boot by a Death Adder as he was digging in the quartz on his knees at Tibooburra (from memory) and he ended up buying a set of Gaiters as a result of his scare. It would have scare the pants off me too. Doctor Robert Johnson was bitten on the arm by an injured Eastern Brown Snake he was trying to help in March last year (he survived) and earlier this year a man was killed by an Eastern Brown Snake while trying to protect his pet dog from the serpent in January this year. He was bitten on the finger as he tried to separate the snake from his dog - which was holding the snake in its mouth. The bite to his finger killed him in less than an hour. He died AFTER being administered antivenom. He also died while being resuscitated by hospital specialists. It's eye opening to see that having medical attention on hand and even taking antivenom isn't always a miracle cure. Story can be found HERE. Some snake venom is neurotoxic and some venom is haemotoxic. The haemotoxic is horrible because it affects the heart and cardiovascular system while destroying blood cells and destroying the tissue at the site of the bite and clotting the blood at high speed... then allowing the victim to bleed out internally when the accelerated coagulants are used up. The neurotoxins in some snake venom is also horrible... it acts on the nervous system and can elevate muscular contractions to the point where the body goes into shock. Even the bite from a baby Brown Snake can (and has been) fatal. Something interesting about the second-deadliest land snake is that Brown Snakes change their venom chemistry as they get older and their prey changes. Baby Brown Snakes lack haemotoxins in their venom... and yet adults can produce it readily due to change in diet from lizards to small mammals. Baby Brown Snake venom is a cocktail that is based on neurotoxins ... devoid of haemotoxins.. and yet a Baby Brown can still kill. One of the reasons for this is that Antivenom is made from the venom of adult Brown Snakes which means the serum appears to be less effective towards bites from juveniles. So either way, you don't want to get bitten. Ever. The Small Eyed Snake has a venom that produces Myotoxicity effects that are only partially understood. The Coastal Taipan contains Myotoxins, Haemotoxins and Neurotoxins. 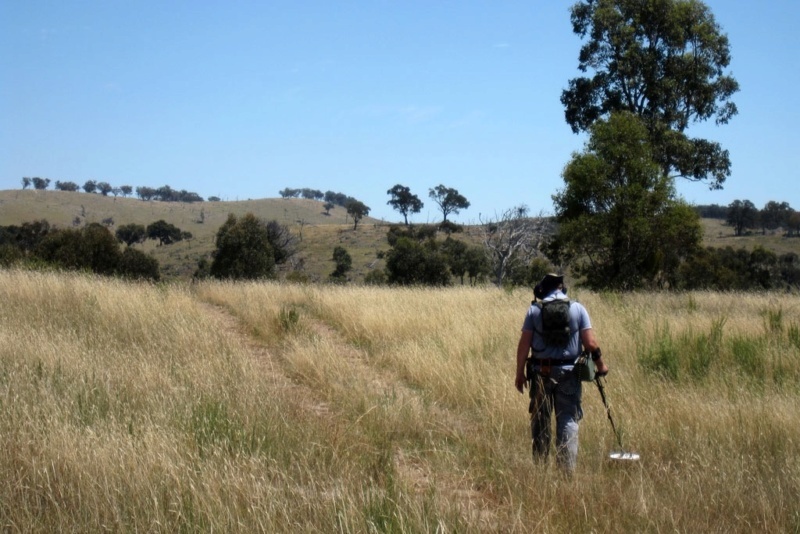 My old friend detecting on a private property at Sally's Flat some years ago with thick cargo pants and serious boots on his feet. Dark Corner alluvials (NSW) a couple of years earlier to the shot above... I can't believe we wandered this area without Snake Gaiters. We even saw a Brown Snake retreating one day so we knew they were there. I sure love seeing snakes but I won't approach the venomous ones within striking distance. The shots below were mostly taken using a 100mm/160mm lens from a distance of several feet. I got out of a vehicle on a track near some gold diggings last year at Ophir and decided to leave my Gaitors in the car because I just wanted to see what was around the side of the track we were on. I started to examine some old slate on a hill when something jabbed into my heel, just above my shoes but into my calf and I had no idea what it was. It could have been a wasp or more likely an ant but it felt like a snake. One of my companions is a nurse and I had her keep an eye one me. No idea what it was. We all take extreme precautions in snake country these days. A Tiger Snake from near the Colo River. I used a 100mm lens for this shot... that's as close as I'll get. Obviously snake bites are quite rare. But we had a fatality very recently here in Western Sydney and the only case of a prospector getting bitten (and killed) by a brown snake in modern years that I know of was over in Western Australia a couple of years ago. In that instance they decided to kill or move the snake from their camp where their wives and dogs were and one of them was bitten. The majority of snake bites tend to be from trying to handle or pick up and move snakes. But that boy who died near Penrith a couple of years ago was bitten as he walked past a Brown Snake. This is especially true of the Copperhead snakes in Australia (not the US snake by the same name)... people trying to move them tend to get bitten. The prospectors in the 1850s used to claim that the bite of a Black Snake was always fatal. 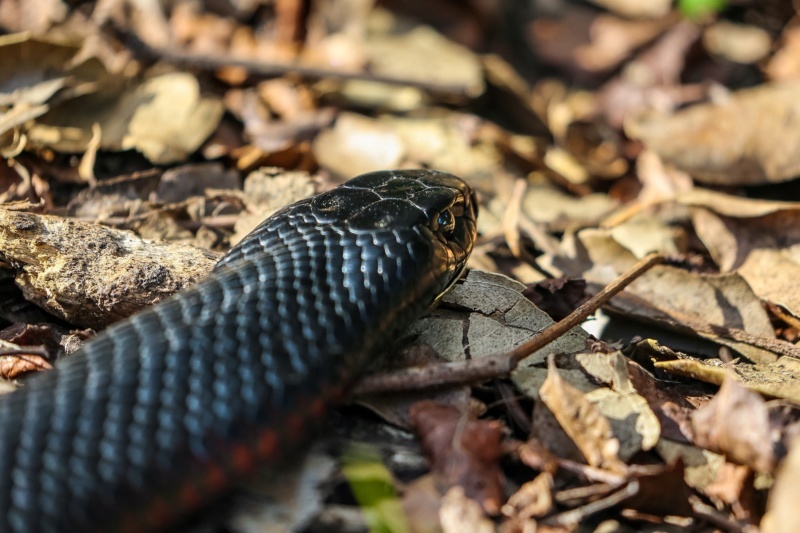 Times have changed although the Red Bellied Black Snake was recently revalued when scientists found the venom to be far more powerful than previously thought. But I can remember chasing some very large Red Bellied Black Snakes with a camera in one hand and a metal detector in the other and those snakes ALWAYS out ran me, even downhill. They'll go to incredible efforts to avoid coming into contact with you. They're incredibly beautiful creatures ...if you can get past the stigma they carry. But they are unpredictable, even if you take into account the slight differences in behavior each species exhibits. In the goldfields I ALWAYS wear a set of Snake Gaiters (brand name is: SNAKE GUARDZ) that I bought on Ebay from the USA... although Coiltek were selling the same type in recent years and so were the Miners Den stores (though I haven't seen them for sale in a year or so). There appears to be a member of this forum selling them from QLD on Ebay at the moment. 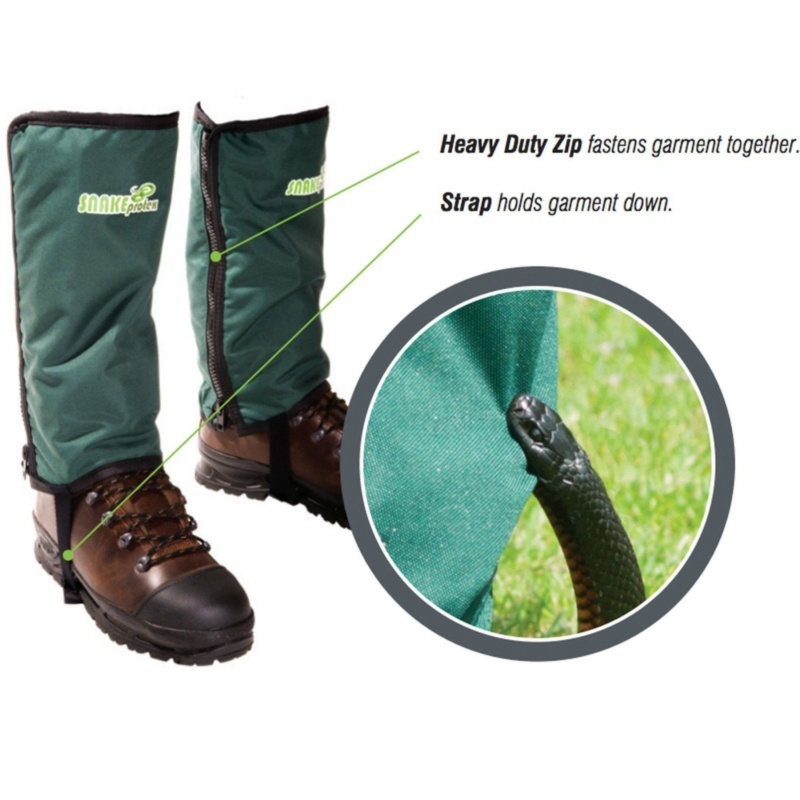 Snake gaiters (designed to resist snake bite) are different to regular "grass gaiters" (designed to protect your socks, shoes and legs from scratches, grass seeds and thorny plants). Leather gaiters can often be penetrated by larger snakes and snakes with longer fangs and so can the regular non-snake leg gaiters. To test, jab a needle or sharp metal spike hard against the leather. Use a sewing needle instead of a thumbtack. If it penetrates then so will a snakes fangs. * Carry a pressure bandage all the time. Special snake-bite pressure bandages are now available in Australia. * Wear jeans or at least long pants in snake country. Bare legs are a high risk factor. * Long Grass and Short Grass can conceal snakes. * Snakes tend to bite as they make contact so long pants make a good first barrier. * Jeans can provide an effective bite barrier in some (but not all) incidents of snake bite. * Carry a hiking stick (or your prospecting pick) to deflect an advancing snake. * Always check over the other side of a log or a rock before jumping over it. * If bitten stay as calm as possible to reduce the speed of the venom spreading. * Splint the limb to avoid moving the venom through the lymphatic system. * If you spend time in remote regions, carry an EPIRB beacon. 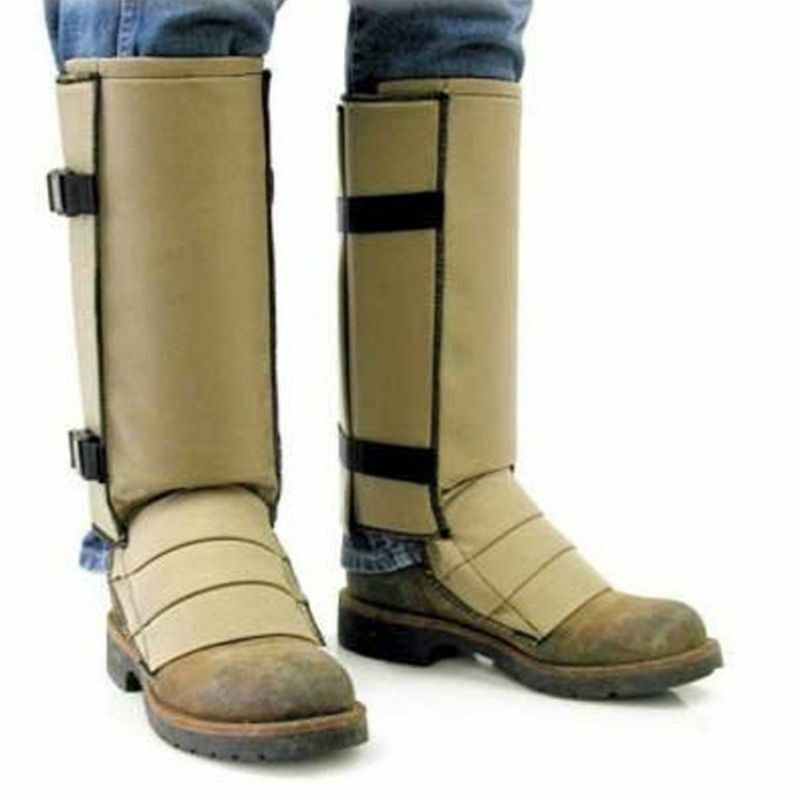 Snake Gaiters and good boots will prevent snakes, cactus spines and ants from making a mess of you. My friend was screaming in pain from one of these cactus spines literally as I was taking this photograph. Spray a little Deet (Bushman's) onto your shoes and lower edge of your gaiters to deter leeches and ants from hitching a ride. A good set of Snake Gaiters will last you a decade or so of regular use (presumably until the plastic buckles give out). The ones from the US are rated for Rattlesnake Strikes and those are VERY large, powerful snakes with long fangs. Australian venomous snakes are common but usually shy. The Brown Snake is one of the very few snakes in the world that will attack, even if you haven't harassed the snake. They will follow you over a short distance to try and bite in some cases. Tiger snakes have occasionally crossed roads to bite people. 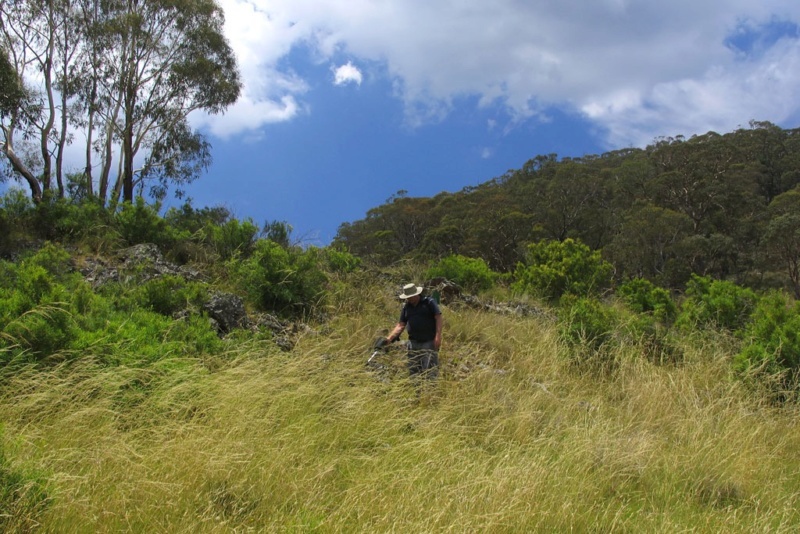 The State Forest workers working in long grass in NSW found that the Tiger Snake was the only species to strike HIGHER than the knees... with most strikes aiming at the hip or mid thigh. For this reason they now have their workers wearing waist-height rubber waders when working in long grass where Tiger Snakes abound. Two of my prospecting companions fitting their own SNAKE GUARDZ snake gaiters before detecting. I bought this set online (Ebay) along with a set for my wife. This picture was posted here back in 2010 when we first wore them and they're still in the same condition today (with a little dirt on them... see pic below). I was heckled for having clean shoes when I posted this image here. I think I paid about $75 for these online from the US + postage (total cost was about $150). Sold under the brand name SNAKE GUARDZ, these sell for about $115 in Australia and are very comfortable to wear all day. Here's the same pair from above that I was wearing last month with the Mossy Oak pattern. I have been on me on about 60% of my trips out. if I'm panning or sluicing in a creek I tend not to wear them but if I'm detecting, bush-walking or walking over snake-infested ground I'll put them on every time. The Ants can't seem to get through them and they're impervious to those terrible cactus plants. Tentworld, Anaconda and Bunnings all advertise "Snake Gaiters" but the products they sell (around $39 each set) appear to be Grass Gaiters. These usually fail to resist a serious strike. Most of Australia's venomous snakes use a muscular contraction to pump the venom through the hollow fang into the wound. The main troublesome snakes for SA and NSW will be Brown Snakes, Copperheads, Black Snakes and Tiger Snakes... Less seen but very deadly are the Death Adders which often sit motionless under leaf litter. These snakes all strike hard and sometimes chew to inject more venom. Their fangs are like steel needles and multiple bites can result in multiple envenomation. Some of our less venomous snakes (whip snakes and brown tree snakes etc) have a rear set of fangs up the back of their mouths that can't easily break skin but can help the snake when killing frogs etc that fit into their mouths. There's anti venom available around Australia now but if you're bitten, you should apply a pressure bandage and immobilize the limb without washing it. Doctors can take a venom sample from the bite site to positively identify the species. The most common snake (Eastern Brown Snake) is the one most likely to bite you. It's terribly common and terribly aggressive. The most painful bite will be the Tiger Snake. We don't see too many Taipans but those are also a concern for Northern Aussies. I came across these the other day online... they might be of interest to you. Whilst about $35 more than the ones I've purchased, they looks quite comfortable and easily carried. You'll want to be wearing solid shoes with them but they might be of interest.... (see link below image). 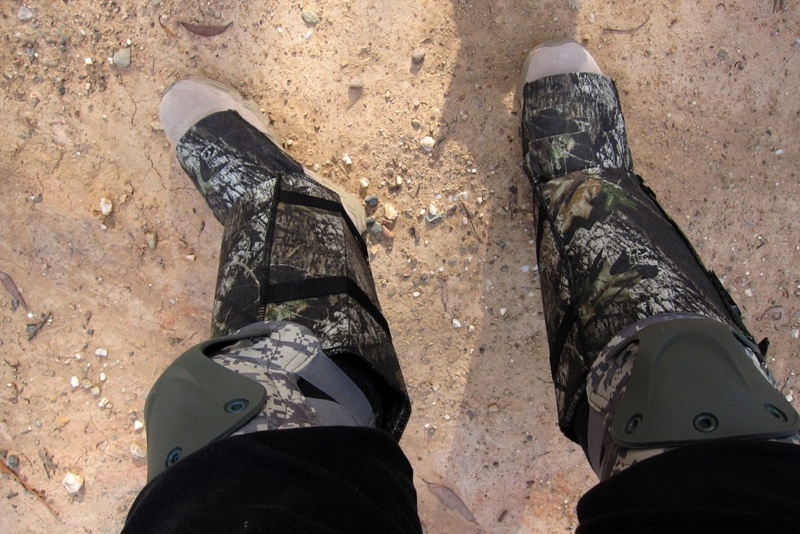 At $146 they seem to be acceptably priced although anything over $150 is a bit steep these days for Snake Gaiters. Abror Green is selling these same pair for a little over that amount but they do look comfortable. I think it's a good idea to get out the wallet and buy a set of Snake Gaiters if you don't already have a pair. A thick pair of gumboots will repel a fairly hard strike from a snake if you're working in a creek with them. 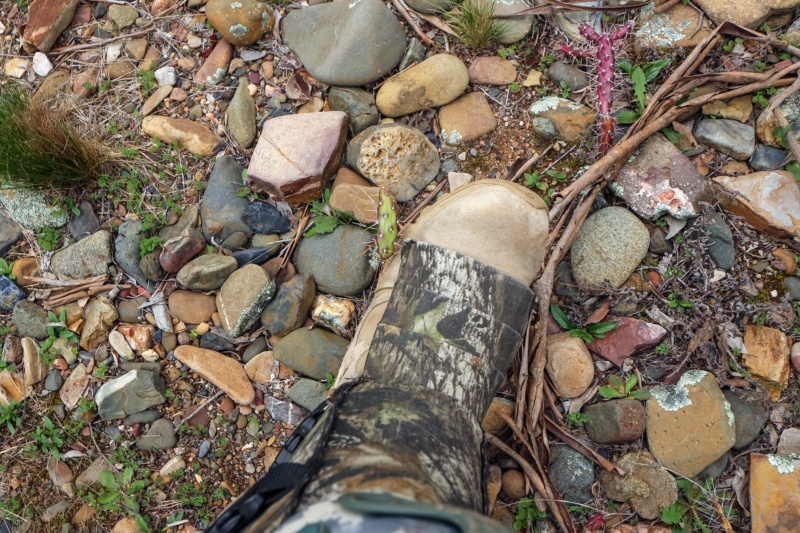 The SNAKE GUARDZ brand that I wear has no under-the-boot-strap so it doesn't wear if I'm walking over sharp rocks etc and that might be a consideration for folks working stony areas or walking long distances on foot regularly. I keep a pair in my Minelab detector bag and have done so since buying them back in 2010. They contain what seems to be polycarbonate panels stitched into the various flaps and have no metal parts or clasps to rust. My wife is from Canada so she's always wearing cowboy boots since surviving a Timber Rattler strike on her boots in a barn when she was younger. She wears bellbottom jeans and cowboy boots in the goldfields these days in lieu of her Snake Guardz and I'm not going to complain since together they form an effective double barrier. Any precaution you take in Australia against snakebite is a good and logical one if you spend any time in the bush. Nero! 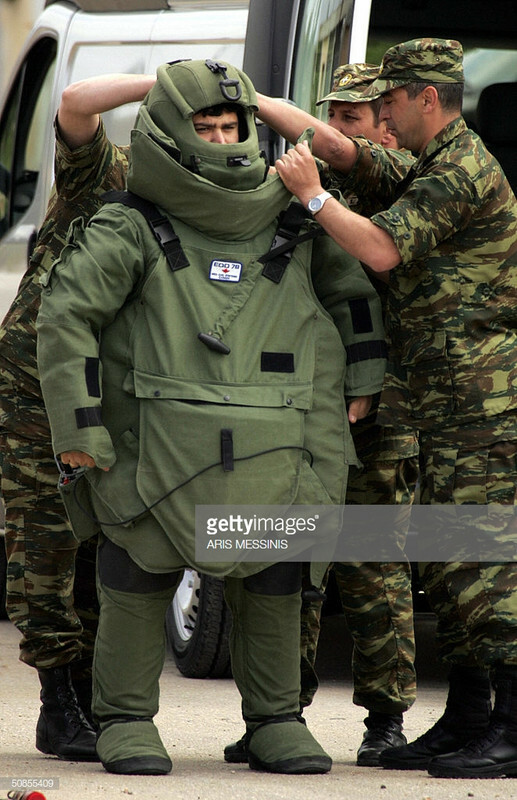 You gotta stop putting pics of your missus on the forum. My heart can't handle it. Even with the hat and the snake gaiters and looking at the ground. Is there any more where that one came from who might like old blokes with dodgy knees and no money? There is no need to identify the snake anymore, the anti venom these days is generic effective for all snake species. Hi Nero-design ,fantastic post ,agree with everything . I've seen first hand the devastating effects of snake bite. A bloke was admitted to an emergency dept with snake bite they gave him anti venom and being a "HE" man, decided he was ok and self discharge against medical advice because he had "better things to do". 3 days later he returned in a serious condition ended up on dialysis and spent the next 4 weeks trying to live,he survived but not a well "HE" man now! A timely post for all to read. Here we go, the new look Prospector for 2019 season? Snakes & sharks the media love them, their sensationalist coverage is guaranteed breaking news with every event. adrian ss wrote: Nero! You gotta stop putting pics of your missus on the forum. My heart can't handle it. Even with the hat and the snake gaiters and looking at the ground. Is there any more where that one came from who might like old blokes with dodgy knees and no money? Our friends with their own anti-snake measures in place. Hey Adrian! She lovely but that's not my girl in the pics above (my wife is a blonde) ... they're friends of my wife and I and are married to each other. She's from Brazil and has a medical background. They love going out to the goldfields with me. Incidentally, I've just been talking to them online this hour as they were BOTH bitten by a redback spider they found in their bed and as of this morning she's in hospital being treated. I think they're about to send her home with an ice pack. But they both have swelling visible in the photographs they sent me (she was bitten on the arm and he was bitten on the leg). We had to remove the knife from the front of her belt (in that pic I posted earlier) because it interfered with the coil on her detector slightly. Hopefully they'll both be on the mend soon because we're due out in the goldfields in a couple of days. Neither is exhibiting the convulsions and muscle spasms that can occur but they're both feeling nauseous and in considerable pain. They retrieved the spider to take with them to the hospital. Something to consider is that the juvenile Redback bites are every bit as toxic as those from an adult. Remember how we used to say that Children and Older Adults were susceptible to the Redback bite? There's been a change to this belief in recent years... I read today we no longer adhere to the belief that children are susceptible to the Redback bite... but that both children and dogs (but not cats) may show additional resistance to redback venom. I'm afraid that my wife has been on medication that has caused her to put on weight recently and she's pretty unhappy with being photographed these days. She can't handle the Australian heat like she used to and rarely comes out with me these days except in cooler weather (which is a bit of a shame). But she's modified her food and exercise and is improving. Glad I do not detect in NSW. I have a pair of snake gaiters, need to get a pair for my wife, but whether she will wear them ( and riggers gloves) is the question. In WA she has moved logs and uncovered snakes, then does not detect for the rest of the day, anyway will make the purchase. We live opposite a reserve with a small creek in Adelaide, had snakes in the front yard and even though I have blocked off the gates and under fences, in years past have come across small and medium size snakes in our backyard, so have increased/improved the blocked outs, even going so far as to put rolled up wire in our storm water pipes where they outlet to the gutter, as an acquaintance had them travelling up the storm water pipe into his roof. Redfin wrote: There is no need to identify the snake anymore, the anti venom these days is generic effective for all snake species. I just rang the Reptile Park to confirm the compounds used (they perform the venom extraction there). Sounds like a cure-all but the Gosford-based wildlife park has a venom center that supplies the Commonwealth Serum Laboratory (BioCSL) ...which still produces 5 different Anti Venoms plus the Generic Polyvalent version you mentioned. Two of the antivenoms they produce are for overseas snakes kept in Australian zoos and those are the Cobra and the Rattle Snake. This is in case a bite occurs during feeding and handling or if the snake was to get out. The other antivenoms they produce include Tiger Snake, Brown Snake and Death Adder (plus another). 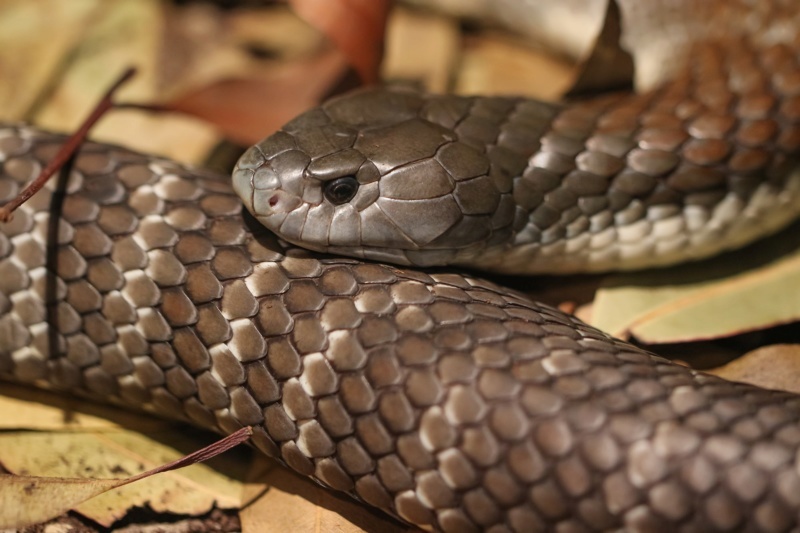 If you're bitten by a King Brown (which is actually from the Black Snake family), then the Black Snake Antivenom must be administered since the King Brown Snake (even though it is brown) is a Mulga Snake and is not from the Brown Snake family. The producers of "POLYVALENT SNAKE ANTIVENOM" (that's the name of the product) note on their information page PDF available HERE that administering Polyvalent Snake Antivenom should not be done if the snake can be identified. 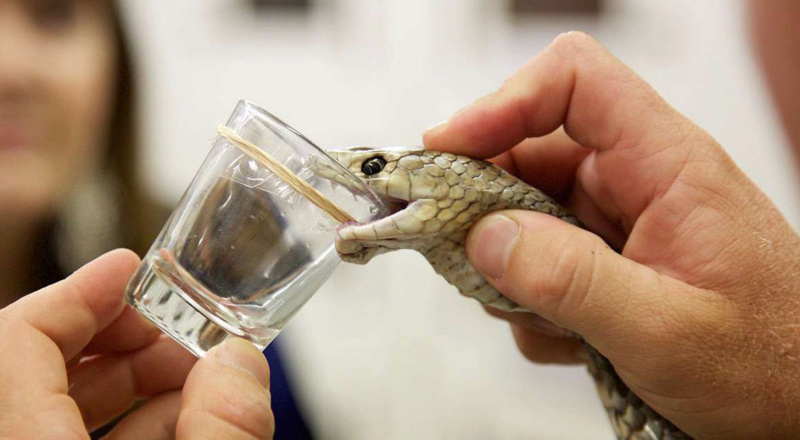 Another section recommends testing the bite area for venom with hospital venom detection kits to identify the snake before administering any antivenom (page 2). Obviously there's a considerable risk of complications for some patients. So if anyone gets bitten by a snake, it would seem that the snakes in Western Australia might cause confusion and the markings from even the common Brown Snake vary from adult to juvenile and from state to state. Some even have spots or stripes that may fade or become more visible as the snake ages. moredeep wrote: ...3 days later he returned in a serious condition ended up on dialysis and spent the next 4 weeks trying to live,he survived but not a well "HE" man now! Interesting example of someone who felt fine at the time but got worse later. That snake handler I mentioned had something similar happen and he was discharged by the hospital but developed symptoms later in the night and had to be airlifted from his home to get him to hospital (Brown Snake bite on the hand). Kidney dialysis is no easy thing to deal with. I hope that guy you mentioned was eventually able to get off the machines. I think that as we get older and our kidney function becomes strained from age, damage and even medications that a snake bite might be the final straw for these organs. I don't think I'd handle a bite from one of out more venomous snakes well. I'll probably show more caution myself next time I'm out. I got bitten on the ankle by a Jumper Ant on Blackbutt Mountain (Dark Corner State Forest) and ended up with aching kidneys for most of the rest of the day. It really surprised me. My lower back felt bruised. That ant venom is potent. Blimey Nero, I got my IDs well and truly wrong. Hope they recover quickly from the spider bites. The ole Red Back can make you crook for a while. being in a bed is a bit unusual for those critters. From memory Nero, the anti venom worked but he didn't stay long enough to have his bloods monitored for renal function,kidney function decline over the next couple of days and bingo! Talking to a friend in the Vic Golden Triangle around 3 weeks ago, he told me that his Fox Terrier (that I had met and befriended,..... but it was friends with everybody) had died due to being bitten by a Brown snake, it killed the snake but died within a hour. Made me think, last summer I signed up for pet insurance just in case of snake bite ( the only reason for sign up, vet bills between $2,000 and $10,000) but with only an hour window, any bite needs to happen while we are home and just about see it happening, then to get to the vet say within 30 minutes to allow any treatment to take affect. Hi pete, 3 weeks ago our local vet said he had 6 dogs brought in with snake bite and that was over the weekend ,2 were on respirators ,he said welcome to snakebite central,luckily we were there with our dogs just for vaccinations. adrian ss wrote: Blimey Nero, I got my IDs well and truly wrong. I'm guessing the spider came in from the garage if they were trying to dry sheets there or something but I haven't asked them. If the girl is from Brazil she may have placed folded sheets on the floor or in a dark cupboard without thinking to check for spiders before fitting them to the bed. I'll try to find out more in a day or two. That was a really interesting article on ant stings and venom! I had no idea that Stinging Nettles use formic acid and oxalic acid (which is something I occasionally use to clean gold with). They sure hurt when you brush up against them, even slightly. This touches on the subject of Snake Gaiters again: I found myself almost knee deep in stinging nettles on the Turon the other day and didn't even notice. The 'Snake Guardz' I was wearing blocked them all. I was thinking at the time that this was just another benefit of wearing them and forgot to mention it here. I didn't end up with any irritation when handling (removing) the gaiters later either (which was good). Thanks for the usual excellent post Nero.